Bermuda's new war memorial (see photo above) was completed in November 2010 by the Ministry of Public Works. It sits on the Cabinet Grounds just east of the Cenotaph and contains the names of almost 3,000 Bermudian men and women who served in the two World Wars. Names are inscribed on seven highly polished black granite slabs and a diamond emblem in gold leaf beside a name indicates that the serviceman or servicewoman is on the roll of honour and lost their lives in wartime service. A fountain in front of the memorial is made of a granite base and a highly-polished pink granite ball which is the same stone used in the Anglican Cathedral in Hamilton. Seating is provided at the memorial and it is a serene place where surviving War Veterans, their children or grandchildren other other relatives, members of an appreciative public and visitors may gather to reflect upon and pay respect to those who served our Island so heroically during the Great Wars. Here in the British Overseas Territory of Bermuda, also in Canada, United Kingdom and elsewhere in the British Commonwealth of Nations, Remembrance Day, November 11, at the National War Memorial and Cenotaph on Front Street in the city of Hamilton, occurs annually. It is a solemn and sad Bermuda Public Holiday. It honors and pays tribute to those who who fought and fell as Bermudians and British subjects in units of the British Armed Forces during the 1914-1918 Great War (World War 1) conflict. They gave their lives in defence of freedom. 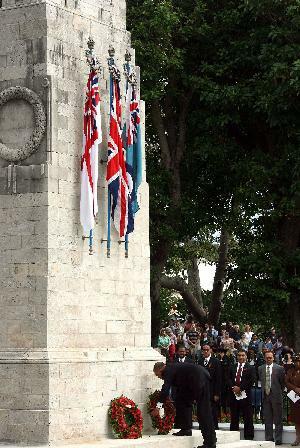 In England, on every Sunday before Remembrance Day in London, the Foreign Secretary, on behalf of the Foreign & Commonwealth Office, London, England, which administers Bermuda, lays before the Cenotaph (later copied by Bermuda) in London a wreath to the fallen who died in the wars from the British Overseas Territories which include Bermuda. He is accompanied by the UK's Prime Minister, and leaders of the Opposition - those from the main Conservative and Liberal Democrat parties. The wreath is supplied to the FCO by the Directors and Staff of, and hand-made at, Kew Gardens, Britain's finest gardens, from flowers and botanicals in its collection from all the Overseas Territories including some prized Bermudiana. It always includes sprigs of two endemic Bermuda species, the Juniperus bermudiana (Bermuda Cedar) tree and Chiococca bermudiana (Bermuda snowberry) shrub. On November 11 each year at 11 am there is a dead silence observed by all present. It marks the 11th hour of the 11th day of the 11th month of 1918 when an Armistice was finally signed by the protagonists, after more than four years of fighting on the battlefields of Europe. Millions of soldiers were dead, dying or mutilated. They included many Bermudians shown below, plus Americans, Australians, Canadians, New Zealanders and more. They died or survived while serving in the British Army or Royal Navy or Royal Flying Corps, later the Royal Air Force, after earlier basic training in the Bermuda Local Forces of the Bermuda Militia Artillery (1894 to 1965) or Bermuda Volunteer Rifle Corps (1894-1946), later Bermuda Rifles (1946-1965). On November 11, 1920, the first such Remembrance Day of veterans to honor their fallen comrades occurred at the then-newly-built Cenotaph in London, attended by Britain's King George V. Since then it has been an annual tradition. In Bermuda, a copy of London's Cenotaph was built on Front Street in the City of Hamilton and for years annual Remembrance Day parades were held there. More than 90 Bermudians died for Britain in the Great War. Wreaths to honour the war Veterans dead of Bermuda are laid at the Memorials above by the Governor, Premier, Hamilton Mayor, Opposition Leader, followed by the president of the War Veterans' Association, the Defence Board chairman, the Royal Bermuda Regiment's commanding officer (the regiment was formed in 1965 from the amalgamation of the former Bermuda Militia Artillery and Bermuda Rifles), the Commissioner of Police and the Chief Fire Officer. Parading along Front Street wearing their war medals are the ever-fewer remaining living war veterans of World War 2 well enough to attend, including former members or their representatives of the Bermuda Home Guard and Bermuda Contingent of the Caribbean Regiment. All relatives or descendants of a World War veterans are invited to take part. Participants are welcome to wear the medals or awards of the person they are representing. They wear the decorations on the right arm rather than the left. They are always watched by a large gathering of other residents and visitors. They are accompanied by the Bermuda Regiment Band and Corps of Drums, the Salvation Army, North Village and Somerset Brigade Bands, and the Bermuda Islands Pipe Band. All join in singing hymns, and in participating in a two-minute silence on the 11th hour of the 11th day of the 11th month since the end of the First Word War. An additional parade takes place in St. George's. Bermudians also served in the Korean War of the 1950s (but with US Forces). 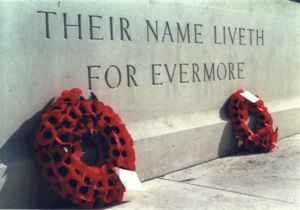 Only one Bermudian (not just born in Bermuda but also of Bermudian parents or parent or elsewhere, again with a Bermudian parent, see Citizenship) is known to have served in later British military conflicts such as Suez, Kenya, Iraq and Afghanistan (also now part of Remembrance Day in the United Kingdom). He is Major General Glyn Gilbert, CB, MC, served in the British Army in post war conflicts in Palestine, Malaya and Cyprus. For details of his life and military successes see http://en.wikipedia.org/wiki/Glyn_Gilbert. Remembrance Day is the culmination of the annual Bermuda Poppy Appeal conducted by the local branch, Bermuda Legion, of the Royal British Legion (RBL). It is a registered charity that works to assist war veterans and their widows. RBL a worldwide organization that provides a wide range of assistance to veterans. Some include assistance with medical bills, assistance with urgent loans and assistance with Christmas presents. RBL Bermuda call also upon the Royal British Legion's head office in London for larger capital funds and grants. It honors all men and women from the Island's armed forces who lost their lives during the two World Wars. Poppies are available seasonally throughout the Appeal at places including the Cabinet Office, the Corporation of Hamilton and the Bermuda Regiment, as well as churches and participating businesses. Donations are appreciated. The town of St. George's also remembers the Island's war heroes, at a Remembrance Day Parade in the Town Square opposite the War Memorial. Those present include the Mayor, The Royal Artillery and Ex-Artillerymen's Association, Bermuda Island Pipe Band, The Bermuda Regiment Band & Corp of Drums, Bermuda Sea Cadets, St. George's Girl Guides, Bermuda Fire Service, Bermuda Regiment Wreath Bearers, Bermuda Regiment Gun Troop, and the Boy Scouts all participate in the ceremony. At the HMS Jervis Bay memorial at Albouy's Point, The Bermuda Sea Cadets host a Remembrance Day service. It is one of a number of memorial events around the world to honour those who served on the HMS Jervis Bay, a 50,000 ton container ship that visited Bermuda during the war years before it was sunk as it confronted the superior firepower of a German warship in 1940 while escorting a convoy from Canada to the UK. When veterans served with a British unit - as most of them did - they also get the HM Armed Forces Veterans Badge, and a War Pension from the United Kingdom. Eligibility to this prestigious badge was widened following Remembrance Day 2005 to include all those who served between the end of the Second World War and December, 1954, thus encompassing the Korean War and military campaigns in Malaya undertaken by British forces. Another local veteran, also honored, served in Korea with the US Army. Unlike in the UK, USA, Canada, etc. there are no retirement homes or hospitals specifically for World War veterans. 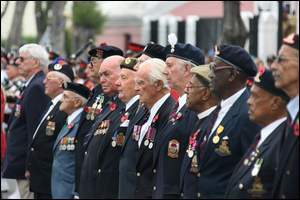 However, in Bermuda, registered veterans and their widows get a Bermuda War Pensions benefit of from $800 a month, plus full coverage on all prescription drugs, medical tests at King Edward VII Memorial Hospital and partial coverage for medical visits to local medical general practitioners and specialists. Bermuda charity 109. Bermuda Legion, e-mail nosoldierleftbehind@hotmail.com or call 293-3975 or 703-6180. The mission is to assist war veterans and their widows. Looks after Bermuda WW1 and 2 and Korean War, etc. war veterans of past, present and future officers and soldiers in units now part of the Bermuda Regiment. Can air-ambulance people, can provide travel costs and cover medical expenses, which the former Royal Bermuda Legion could not. Has helped with air evacuations; has an annual Christmas appeal, taking food hampers and baskets all over the Island. Assists in individual cases of need, helps with healthcare bills, and helps many people find help with the different Government agencies, such as Financial Assistance. Can provide immediate assistance for people without having to go to London for it. Fund raising remains constant for war veteran widows, whose assistance from Government has been cut in recent years. Everything the Legion raises stays in Bermuda. In the ten-day run up to November 11, the Bermuda Legion sets out on its campaign with the signature red poppies. 2019. January 3. A veteran’s widow left immobile after a fall has become the first to benefit from the Bermuda Legion’s Poppy Appeal in November. The legion bought a bed hoist, which was installed yesterday by Lighthouse Medical Supplies, after the elderly woman was bedridden having been injured in the fall. Carol Everson, case worker for the Bermuda Legion, said the woman, who has not been named, hoped to repay the veterans’ charity by volunteering when she was back on her feet. Ms Everson added: “We are very happy to have been able to help — without this piece of equipment she could not turn or be lifted.” Ms Everson told The Royal Gazette that the Legion had raised more than $23,000 from its 2018 appeal. Last year marked the centenary of the end of the First World War and Bermudian poppies were redesigned with a leaf to mark the anniversary. Ms Everson said the number of poppy volunteers was down on previous years, but thanked Lieutenant-Colonel David Gibbons, a former commanding officer of the Royal Bermuda Regiment, for his help with the appeal. Colonel Gibbons donated the ground floor of Thistle House in Hamilton for the appeal’s fundraising and poppy distribution centre from November 1 to 11. Ms Everson said: “It was brilliant help and a beautiful location — we had a base on Burnaby Street for distribution and for the general public to walk in.” She added: “We work all year round, not just in November, helping veterans with their welfare benefits and urgent needs. Our other duty is the remembrance and respect of the veterans from Bermuda who took part in two world conflicts. Their courage and dedication will never be forgotten.” The legion spent about $5,000 on Christmas presents for 90 veterans or veterans’ widows in need and also bought Christmas hampers. Ms Everson said the Legion had also put aside cash in the hope they could organize another dementia caregivers’ course in the spring. The workshops help caregivers of people with dementia to qualify for cash help from the Government. Previous courses, held in 2015 and 2017, were both oversubscribed. Money raised from last year’s appeal also enabled the charity to distribute leaflets to explain the benefits available to veterans and their families and produce a booklet on the history of the Bermudians who served in the First World War. Ms Everson thanked the Royal Bermuda Regiment for its preparation and service of the Remembrance Day lunch for veterans and John Kane, the World Rugby Classic president, for allowing the legion to collect at the event. Other sponsors included supermarkets Lindo’s and MarketPlace, hardware store Gorham’s, wholesaler Butterfield & Vallis, professional services firm PwC, the Bermuda Sailors’ Home, and the Kiwanis Club of St George’s. 2018. October 29. This charity set up to care for ex-servicemen is to publicize the island’s role in the First World War with a special poster and booklet to mark the centenary of the Armistice. The Bermuda Legion has produced a poster with details of every Bermudian who served in “the war to end all wars” and a pamphlet on the origins and history of the conflict, as well as details on soldiers involved. Carol Everson, welfare caseworker for the Bermuda Legion, said: “It includes the nominal roll of all who served in the First World War — a tremendous number of people served. I have been working on this and similar topics because, when I started for our veterans, I realised there was a great deal that hadn’t been recognized. There were people who had made a huge contribution with their war service in World War One and Two and there were stories that should be told that hadn’t been.” The poster and booklet were unveiled in the run-up to the annual Poppy Appeal, which starts on Thursday. A total of 544 Bermudians are recorded as serving in World War One, most of them in the Bermuda Militia Artillery and the Bermuda Volunteer Rifle Corps, segregated units that would later came together to form the Royal Bermuda Regiment. Some also served in the armed forces of other Allied nations, including Britain and Canada. Ms Everson said that she had spoken in the past to elderly veterans who had heard the stories of men who had fought in the First World War. She added: “It was fascinating, but some of the stories seemed lost and I didn’t think they should be lost for ever, It’s 2018, the 100th anniversary, and commemoration is taking place, so I asked the executive of the Bermuda Legion if we could bring out a book that could be used along with church services and for general education.” Copies of the poster will be given to the Anglican Cathedral in Hamilton, the churches and the Royal Bermuda Regiment and schools. Ms Everson said: “It’s very important for children to learn about this. It’s not glorifying war — war is a horrible thing, but sometimes things happen and good people have to stand up and do something about it.” Ms Everson added that veterans of the Second World War are still alive, although frail and elderly and others who served, but never saw active service, were also ageing and needed assistance. She said: “The Royal Bermuda Regiment was formed in 1965 and we now have very old soldiers who are living in conditions which could be a lot better. Everything we raise from the Poppy Appeal goes to Second World War veterans, their widows or those who support them.” Ms Everson added: “There should also be something for the old soldiers, even if they aren’t war veterans.” Ms Everson said that the Bermuda Legion could also help with applications to British service charities for those in need. This year’s poppies will carry a green leaf in honour of the anniversary. The poppy shop will be at Thistle House on Hamilton’s Burnaby Street this year and poppies will also be sold at the Anglican Cathedral and the Royal Bermuda Regiment, as well as by volunteer vendors in the streets of Hamilton. Ms Everson said other churches or schools who wanted to sell poppies should contact the Legion. Bermuda Militia Artillery (BMA) Black soldiers of Bermuda until 1965, with a proud record of combat in two World Wars. From November 1965 the BMA became part of the Bermuda Regiment, later the Royal Bermuda Regiment. 2018. November 5. The contribution of the Bermuda Militia Artillery during the First World War was honored yesterday. Dignitaries and uniformed services laid wreaths at the BMA memorial in St George to mark the 100th anniversary of the end of the conflict. Fred Richardson, president of the Royal Artillery Association, said: “It’s very important to remember those who served, particularly this year. “It was a long time ago, but that makes it even more important to remember them.” Mr Richardson thanked John Rankin, the Governor; Walter Roban, the Deputy Premier; Craig Cannonier, the Opposition leader; Quinell Francis, the Mayor of St George; and Constance Dierman, the US Consul General, for their part in the ceremony. Bermuda Volunteer Rifle Corps Overseas Association (BVRC) Held its 99th annual reunion at Warwick Camp in May 2018 - always first Saturday in May. Founded in 1919 after World War 1. Commemorates first Saturday of May 1915 when the first contingent of white Bermuda soldiers left Bermuda to join the Royal Lincolnshire Regiment in France. Bermuda War Veterans Association (BWVA) P. O. Box HM 2716, Hamilton HM LX, Bermuda. A local charity, RC 140, founded in 1919 by returning servicemen from the Great War to provide assistance to those who went overseas to serve, originally in the First World War and in other wars subsequently. Assists needy Bermuda War Veterans and their dependants. The Bermuda Volunteer Rifle Corps (BVRC) were considered to be of such a high standard when they joined the Lincolnshire Regiment in the Great War that they were allowed to fight under their own colours, despite being only a company. The Bermuda Militia Artillery (BMA) was the first black unit to serve in the Great War. It distinguished itself on the front and received several battle honours. World War 2 saw similar sacrifice and dedication from Bermudians, many of whom joined other Commonwealth Units such as the Royal Navy, Royal Air Force, British Army, Canadian Army, Royal Canadian Air Force, Royal Canadian Navy, etc. 2017. December 21. Volunteers are hard at work delivering Christmas presents to Bermuda’s war veterans and widows after a successful poppy appeal by the Bermuda Legion. Grocery gifts have been dropped off at homes, as well as to people in nursing homes and hospital. Funds are still coming from November’s annual poppy appeal, when the Legion also got an official visit from the Royal Canadian Legion. Canada’s ex-service association came to the island to compile a report into Bermuda’s Second World War veterans and widows, and to meet dignitaries and war veterans. Bermuda Legion is affiliated with the Canadian group, as well as with the Royal Commonwealth Ex-Service League in London, which allows island veterans and widows in financial need to apply for a small extra pension. Carol Everson, welfare caseworker for the Legion, thanked former Bermuda Regiment commanding officer Lieutenant-Colonel David Gibbons for the use of the Gibbons Company store at the corner of Queen and Reid Streets as a pop up poppy shop. She also thanked John Rankin, the Governor and Royal Bermuda Regiment soldiers for pitching in to help with the organization's tag day. Ms Everson also saluted the St George’s Kiwanis for a celebration to honour veterans, as well as hardware store Gorham’s and Martin Buckley of Brown & Co for fundraising help and “all the kind people and businesses who gave their time and donations”. She added: “We’re extremely grateful to all the schools who contributed and to the 90-plus year-old war veterans and widows who also collected.” People who need assistance from the Bermuda Legion or help in applying for the REEL pension should e-mail Ms Everson at bermudalegion@gmail.com or call 293-3975. 2015. November 10. Time is running short for the Bermuda War Veterans Association, now precariously short on funds. With just three years remaining in its reserves, the group is appealing for help in its support for a group of 11 veterans and their dependents. “I don’t see us being able to pay our expenses if we can’t raise more,” said the group’s president, Jack Lightbourn, speaking shortly before Remembrance Day. The association has acquired extra burdens as its officers get older, according to Mr Lightbourn: the organization is increasingly reliant on external help for administration, which comes at a cost. The youngest of its members is 89, while the group itself was established 96 years ago. Grateful for the corporate and public generosity that has sustained it, Mr Lightbourn said the association would have been unable to provide financial support ten years ago, had it not been for its reserves. The association was once active selling tags and ran a club that was “well patronized”, he said. “The club was only allowed to spend 50 per cent, and the other 50 per cent had to be put aside for the needs of veterans. We were fortunate enough to be able to get that up high.” However, just three years’ worth of funds remain in the bank for the organization to continue paying out roughly $120,000 in financial assistance. At present, public collections cover about a quarter of that. “We are not able to go out collecting on the streets any more — it’s very difficult to get the amount of people we need to help us,” Mr Lightbourn told The Royal Gazette. “Unless we can get 12 or 20 people to go out on the streets, it’s not worth people’s while. We are much better sending out letters and advertisements.” Peter Darling, a veteran of the Royal Marines, said the association had struggled with funding for years now. “The association is doing what it can. I support it, obviously, just less than I used to. My wife and I have had to make drastic cuts on what we give to charity. They have always been short of money but any charity has less these days.” The group’s appeal went out as the Island prepared to mark Remembrance Day. The parade commemorating those who served and fell in two World Wars will embark at 10.30am, with Michael Dunkley and Governor George Fergusson leading the laying of wreaths at the Cenotaph, along with the war memorial on the grounds of Cabinet. The ceremony will take place in the Anglican Cathedral in the event of bad weather. “Though the numbers on parade sadly decline each year, that spirit is still strong and it is with considerable pride that Bermuda pauses on Remembrance Day to reflect on their service,” the Premier said. “We will remember them.” Walter Roban, the shadow national security minister, said: “It is so important to be reminded that the freedoms and privileges we enjoy were hard fought for by young men and women on our shores and on battlegrounds in distant lands, some never to return. Each generation of Bermudian must be instilled with an understanding of the value their service and sacrifice means to all of us. It is so crucial to our history that we now make sure all who have served receive their rightful benefit and are all commemorated on the Cabinet Grounds with a fitting memorial.” Attrition has also taken its toll on the ageing support base for the Bermuda War Veterans Association, according to William Adams, secretary and trustee for the group. “Quite a few of the people that used to help us have passed on. Our organization was started at the end of the First World War to help the veterans and their dependents. Mr Lightbourn and myself are both veterans of the Second World War — there are so few of us left that we can’t get out there and run a tag day like we used to do. Our problem also is that the people we are supporting are at least 90 years old.” Time had steadily taken its toll on the association, which once owned a club on Dundonald Street but opted in May of 2000 to close it down. Frank Farmer, the president of the day, said the ageing membership no longer needed a full-time location. In 2011, the association announced a sharp cut in its services — again citing an ageing population of donors. It had also lost $45,000 from its shares at Butterfield Bank. For its annual appeal, the association is sending out letters to the roughly 300 donors and companies that have maintained it over the years. The association supports Bermudians who volunteered for service overseas during the Second World War and Korean War, assisting veterans and widows in need of help. To assist Bermuda’s veterans, please donate or write to the association at: P O Box HM 2716, Hamilton HM LX. 2011. November, just days before 2011 Remembrance Day, Jack Lightbourn of the BWVA reported in the media that difficult financial times will result in less money for the Island’s remaining veterans. Mr Lightbourn served in the Royal Navy near the close of the Second World War. He was on a minesweeper with a convoy when they were attacked by a group of German U-boats. 2008. With less than 80 war veterans left. Bermuda War Veterans Commissioners The men whose interests they represent are all senior citizens. See Bermuda Government Boards. Registered Charity 140. Established to provide assistance to those who went overseas to serve, originally in the First World War and in other wars subsequently. It cannot support financially those who served on the home front. Bermuda War Veterans Pension Commission c/o The Accountant General, P.O. Box HM 1537, Hamilton, HM SX. Royal Artillery Association Bermuda Branch Grenadier Lane, St. George's GE 03. Phone (441) 297-1810. Founded in 1920 by Major Philip Lightbourne of the Royal Artillery Association, Bermuda Branch. The group began holding meetings at the St. David's Battery campsite because the Bermuda Militia Atillery, from which its members were drawn, were stationed there. It later moved to its present headquarters in St. George's adjacent to the northern end of Garrison Field. 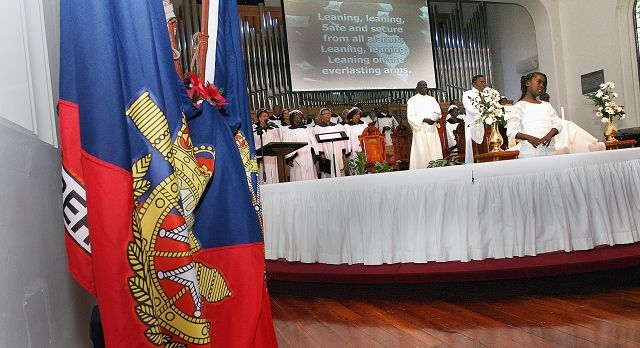 Functions include having an annual Remembrance Sunday Wreath Laying Ceremony, Parade and Church Service in St. George's on King's Square and St. Peter's Church, led by the Band of the Bermuda Regiment, to commemorate Remembrance Day. 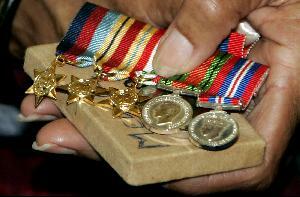 Decorations and medals are worn. Since the Great War of 1914-1918 poppies have been since World War 1 the national and international symbol for British airmen, soldiers, sailors and marines who perished while serving their country in world wars and the Korean conflict. 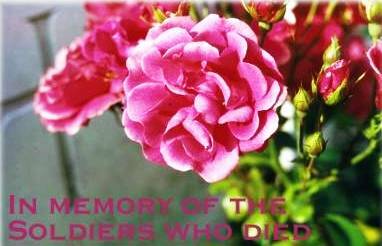 When we mourn Bermuda's dead in Remembrance Day ceremonies each November, we think of a flower - a poppy. Why? Because of the following immortal lines from a poem: "If ye break faith with us who die, we will not sleep, though poppies grow in Flander's fields." The author of this famous "poppy" poem was Colonel John McCrae, who was a distinguished professor of Medicine at McGill University after he served in the Boer War. On the outbreak of war in 1914, he at once enlisted in the Canadian Army, 1st Brigade Artillery, which was sent to fight in Belgium. Soon after landing in Europe, he was made Medical Officer. During the second battle of Ypres in 1915 he was so horrified, appalled and heart-sick over the senseless slaughter of so many hundreds of thousands of men that he penned the following words, used to this day on 11th November. These verses were sent anonymously to the British magazine Punch, which published them in December 1915 under the title "In Flanders' Fields." Colonel McCrae died from his battle wounds in 1918. We are the dead. Short days ago In Flanders' fields." The poem expressed McCrae's grief over the "row on row" of graves of soldiers who had died on Flanders' battlefields, located in a region of western Belgium and northern France. The poem presented a striking image of the bright red flowers blooming among the rows of white crosses and became a rallying cry to all who fought in the First World War. McCrae's poem had a huge impact on two women, Anna E. Guerin of France and Georgia native Moina Michael. Both worked hard to initiate the sale of artificial poppies to help orphans and others left destitute by the war. By the time Guerin established the first sale in the U.S., in 1920 with the help of The American Legion, the poppy was well known in the allied countries — America, Britain, France, Canada, Australia and New Zealand — as the "Flower of Remembrance." Proceeds from that first sale went to the American and French Children's League. Guerin had difficulty with the distribution of the poppies in early 1922 and sought out Michael for help. Michael had started a smaller-scaled Poppy Day during a YMCA conference she was attending in New York and wanted to use the poppies as a symbol of remembrance of the war. Guerin, called the "Poppy Lady of France" in her homeland, and Michael, later dubbed "The Poppy Princess" by the Georgia legislature, went to the Veterans of Foreign Wars (VFW) for help. Following its first nationwide distribution of poppies in 1922, the VFW adopted the poppy as its official memorial flower. However, a shortage of poppies from French manufacturers led to the idea of using unemployed and disabled veterans to produce the artificial flowers. A total of 544 Bermudians are recorded as serving in World War One, most of them in the Bermuda Militia Artillery and the Bermuda Volunteer Rifle Corps, segregated units that would later came together to form the Royal Bermuda Regiment. Bermuda lost 80 men in overseas service in the Great War. They matched up with foot soldiers of British army regiments, and (c) others who had signed up for the Royal Flying Corps (later, the Royal Air Force) and other units. Some also served in the armed forces of other Allied nations, including Britain and Canada. Bermudians en route by troopship to France and Belgium in World War 1. They died fighting for Bermuda and the UK. 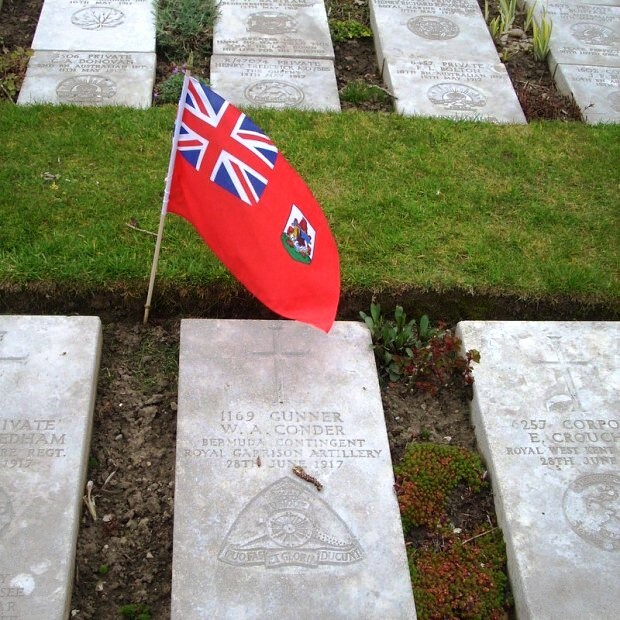 For Bermuda soldiers killed in this Great War and buried overseas in a British Commonwealth War Graves-registered plot, they can be researched at http://www.cwgc.org/. John Brewer. Died in September 1939 after crashing in German enemy territory while fighting for Britain. He was a flier in the Royal Air Force. Bridges, Arthur Percy. Brother of Harry Francis Bridges. Died of wounds in Bermuda on February 25th 1918. Bridges, Harry Francis. Killed at Vermelles, France on November 5th 1916. Lance Corporal, Bermuda Volunteer Rifle Corps attached to 1st Battalion, Lincolnshire Regiment. Service No. 25334. Buried in the British Cemetery in Vermelles. The original wooden cross from his grave hangs on the wall in St. Marks Church, Cherry Orchard, Worcester, England near where he was brought up. His daughter, Eleanor Gibbons-Brown wrote an e-book "War Baby" about her life in Bermuda in the 20th century. Conder, Wilfred Augustus. Gunner, Bermuda Militia Artillery. Service number 1169. Died 28th June 1917 at age 25. Grave Memorial IV. A. 17. Buried in Boulogne Eastern Cemetery, France. Conyers, Walter Neville. 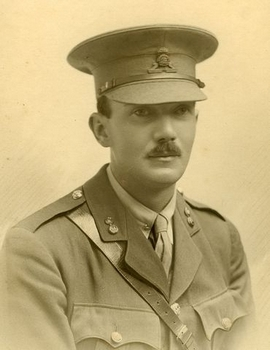 Second Lieutenant, 8 Battalion, Royal Berkshire Regiment, son of Emma M. Conyers and James A. Conyers, of Stanmore, Pembroke. Grave Memorial Reference Pier and Face 11 D, Thiepval Memorial. He had enlisted directly into the Royal Berkshire Regiment on March 9 1915 and went to the Western Front on January 13, 1916. He was killed in action at the Battle of the Somme near Bazentin-Le-Petit at the age of 26. Dickinson, Percival Earle. Private, Canadian Army Medical Corps. Service number 2606959. Died 13th October 1918. Grave Memorial Reference 129. Buried at Pembroke Weslyan Cemetery. Easton, William Edward. Buried in Boulogne Eastern Cemetery, France. Frith, Frederick Hervey, Jr. Served in a Canadian Army unit. Possibly with the BVRC earlier. Understood to have been connected with Frith's Hardware, Front Street, Bermuda. Leonard DeGraff Godet, then 21, died in the First (Great) World War on June 1, 1918. He was a brilliant student who gave his life while serving with the Royal Flying Corps, then the Royal Air Force. Mr. Godet was born in Paget in 1896. He was a Rhodes Scholar, earlier at Oxford University until he answered the call of duty. He received his pilot wings on August 14, 1917 and went to France on active service four days later. He died when his plane was brought down in flames across German lines in France, after completing 16 long-distance raids. 2nd Lieutenant Godet was flying with 2nd Lieutenant Arthur Haley, born 1895, in a DH4 that was shot down by German anti-aircraft fire while over Antilly, near Metz. Haley had earlier been in the Royal Engineers, Signals Division in 1914. He had served in France, been wounded in 1917, was repatriated and in 1918 given a temporary commission in the Essex Regiment, then attached to the Royal Flying Corps, later Royal Air Force. Godet was the pilot and Haley the observer. The two were initially buried together with great honour by French villagers in a grave especially created for them in Antilly, but it is believed they were later moved by the Commonwealth War Graves Commission as they are now reburied in adjacent graves numbered 374 and 375 in the French National Cemetery at Chambieres, Metz. 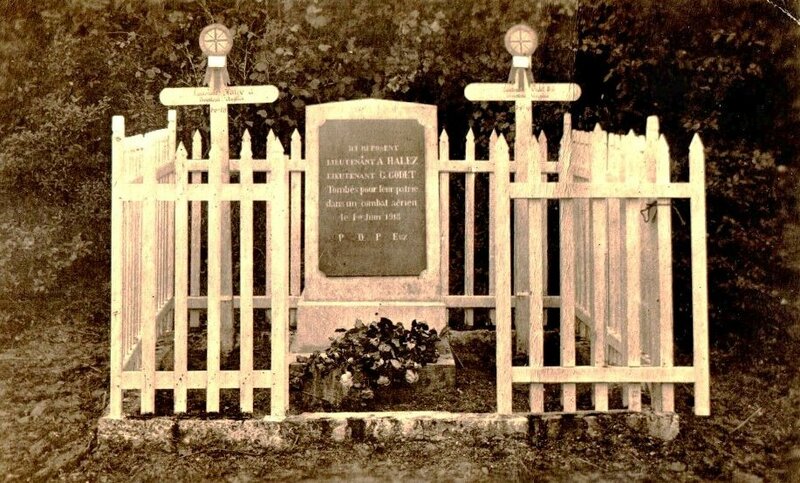 Initial burial place in Antilly, provided by kind-heated locals, of 2nd Lieutenants Leonard Godet and Arthur Haley (spelt wrongly by the locals). They were later reburied, again together. 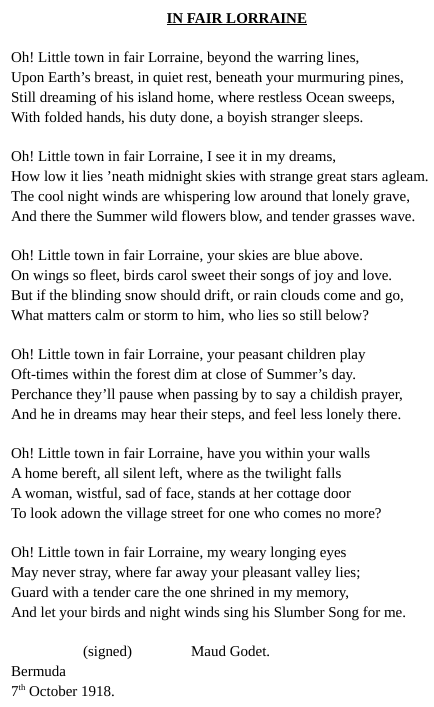 Poem above was discovered by Mrs Janet Bowen (nee Haley), among her father's papers, below, of the poem written by grieving mother Maud Godet of Bermuda about the resting place in Lorraine, France, of her beloved dead son Leonard, buried alongside Arthur Haley. Mr Haley was the great uncle of Janet Bowen, her grandfather's brother. Photos above and additional information and copy of poem above kindly sent in June 2015 to Bermuda Online by Roger Bowen and his wife Janet Bowen, of the UK. Mr and Mrs Bowen also sent a Bermuda Royal Gazette Front Page of October 1, 1918. See 1918-10-01 Bermuda Royal Gazette.pdf. It included (top right) an article entitled "Lt. Godet's Brave End." It credited Mr. F. L. Godet, father of Lt. Godet, for permission to publish an English translation of a statement sent in German by a German major about the death in air combat of Lt Godet. The statement was sent to Mr Godet Senior by a friend residing in Switzerland who was acquainted with the Right Honourable Count Conrad Zeppelin, a well-known and very senior German official and who was appealed to by the friend for assistance in tracing the missing aviator. A courteous reply was promptly given to Count Zeppenin and relayed back via the friend to Lt. Godet's father. Hollis, Edward Kimball. Private, Lincolnshire Regiment ex BVRC. Service number 25343. Died 21st March 1918. Grave Memorial reference Panel 23 and 24. Pozieres Memorial. Joell, Walter. Gunner, Bermuda Garrison Artillery, service number 1035, died 9th December 1918, age 21. Grave Memorial G 27 A. Bois-Gaullaume Communal Cemetery Extension. Lightbourn, Robert. Killed in action July 26, 1917. Acting Captain, Gloucester Regiment. Born November 2, 1884. 1915 Bermuda Rhodes Scholar. Motyer, Arthur John. Born September 2. 1886, 1905 Rhodes Scholar, killed in action September 15, 1916. Newton, Walter Ernest. Petty Officer, Royal Navy. Killed on 31 May 1916 during the Battle of Jutland while serving on HMS Fortune. Little is known about Petty Officer Newton’s Bermuda links, although the Commonwealth War Graves Commission states that he was the son of Walter John and Ellen Maria Newton of Bermuda, late of Portsmouth and husband of Ellen Newton, Whitworth Road, Alverstoke, Gosport. William Edmund Smith. The first Bermudian to die in the Great War, on September 22, 1914. He was a black man who had joined the Royal Navy in Bermuda. He was listed by the Royal Navy as "SMITH, William Edmund, L/1874, 1st class cook." He was the son of William Felix Smith and his wife Emma Jane, nee Douglas, of Herman’s Hill, Somerset. Their homestead overlooked the Great Sound on one side and Sound View Road on the other. Mr Smith’s name is on a War Memorial at a churchyard in Kent; St James Parish Church, Somerset and in the Somerset Methodist Church on Long Bay Lane. He was baptized 1893, June 4, at St James Church, Sandys. Smith had joined the Royal Navy in 1912 aboard HMS Sirius which formed part of the Royal Navy’s North America and West Indies Squadron, based in Bermuda. At the end of that tour, he joined HMS Aboukir when the Great War began. Mrs Smith received a letter signed by Mr Winston Churchill, conveying the sympathy of the King and Queen. He was drowned when his ship, HMS Aboukir, an obsolete Cressy Class armored cruiser launched in 1900, was torpedoed in the North Sea off the Hook of Holland. During the early months of World War 1 the Royal Navy maintained a patrol of old Cressy class Armoured cruisers, known as Cruiser Force C, in the area of the North Sea known as the Broad Fourteens. There was opposition to this patrol from many senior officers, including Admiral Jellicoe and Commodores Keyes and Tyrwhitt, on the grounds that the ships were very vulnerable to a raid by modern German surface ships and the patrol was nick named the "live bait squadron". But the Admiralty maintained the patrol on the grounds that destroyers were not able to maintain the patrol in the frequent bad weather and that there were insufficient modern light cruisers available. HMS Aboukir, HMS Cressy, and HMS Hogue of the Seventh Cruiser Squadron were on patrol in the early morning of that day when U-9, a German submarine commanded by Lt Otto Weddigen fired a torpedo at Aboukir, which sank in 20 minutes with the loss of 527 men, including Smith. His name, with 18,000 other service personnel, is on an obelisk at the Royal Naval Memorial in Chatham, south east England and in Bermuda. When two other cruisers, HMS Hogue and HMS Cressy, went to the scene to rescue survivors they too were torpedoed by the same U-boat with a loss of over 1,459 lives. This incident established the U-boat as a major weapon in the conduct of naval warfare. The horrendous loss of life from this early form of submarine warfare had further bleak repercussions. A court of inquiry was set up and found that some blame was attributable to all of the senior officers involved - Captain Drummond for not zigzagging and for not calling for destroyers, Rear Admiral Christian was criticized for not making it clear to Drummond that he could summon the destroyers and Rear Admiral Campbell for not being present and for a very poor performance at the inquiry at which he stated that he did not know what the purpose of his command was. The bulk of the blame was directed at the Admiralty for persisting with a patrol that was dangerous and of limited value against the advice of senior sea going officers. Symons, Joseph Henry Fulton. Gunner, BMA (but he was reported to have returned home on July 1, 1919). Tatem, Philip Archibald, Bermuda Volunteer Rifle Corps (BVRC). Serving with 1st Bn. Lincolnshire Regiment. Born July 30, 1892, Spanish Point, Pembroke Parish. Killed September 25, 1916 in Battle of the Somme and listed on the Thiepval Memorial (Pier & Face 1C). Oldest son of William Thomas Tatem and Emmie Jessie Miles. He was the great-uncle of Sherri Panchaud Onorati who kindly sent this photo. Temple, George. Born in Somerset on December 31, 1879. and later based in Portsmouth, England, Petty Officer, Royal Navy, killed 31 May, on HMS Invincible. His father had also served in the Royal Navy and it is believed that is why Petty Officer Temple was born on the island. He was 37 when he died in the Battle of Jutland. Tiller, William A. Rifleman, service number Z/2722. Died 6th March 1916 at the age of 19. Rifle Brigade ex BVRC. Grave Memorial Reference E. 7. Buried at De Cusine Vavine British Cemetery, Basseux. Tite, William James. Private, Lincolnshire Regiment ex BVRC. Service number 17156. Died July 16, 1916 at age 21. Grave Memorial Reference Pier and Face 1 C. Thiepval Memorial. Trimingham, James Joseph Lightbourn, Private, brother of Wentworth Gray. Lincolnshire Regiment ex BVRC. Service number 17160. Died September 15, 1915 at age 21. Grave Memorial Reference I. E. 9. Buried at Brandhoek Military Cemetery. Trimingham, Wentworth Gray (brother of James Lightbourn Trimingham). 2nd Lieutenant, Lancashire Fusiliers ex BVRC. Died January 4, 1918 at age 27. Grave Memorial Reference VIII. E.16. Buried at Grevillers British Cemetery. A Memorial Death Plaque for him, known as "Dead Man's Penny" (see below) was issued by the British Government to salute him and many others. Officers and NCOs of Bermuda Contingent, Royal Garrison Artillery, who served in France and Belgium in World War 1. Photographed in England prior to their departure to the front. One of those was William (Lanky) Furbert. British Army photo. Bermuda Volunteer Rifle Corps (BVRC) members who served in France and Belgium with the Lincolnshire Regiment in World War 1. British Army photo. One who enlisted with the BVRC (and lived long enough to write about it) was Allan Livingstone Cooper, one of 16 Bermudians in that unit promoted as an officer during the course of that war. He and his fellow-Bermudians served on the 450-mile long Western Front in France which extended from the Swiss frontier to the English Channel and claimed the lives of an estimated 10 million military personnel and about seven million civilians. He recorded the reaction of troops on the Western Front when the Armistice between the Allies and Germany came into effect at the 11th hour of the 11th day of the 11th month in 1918 in accordance with the Armistice signed by representatives of Germany and the Allied powers between 5.12 and 5.20 that morning. 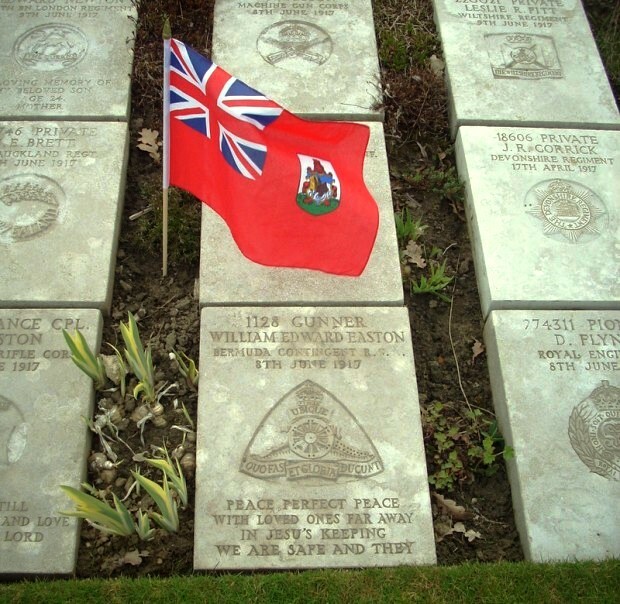 They died fighting for Bermuda and the Allies. For Bermuda airmen, soldiers, sailors and marines killed in World War 2 and Korean War and buried overseas in a British Commonwealth War Graves-registered plot, they can be researched at http://www.cwgc.org/. Baxter, Winston C. Died in Italy in September 1944 and was buried at Pompeii. He had volunteered for and was serving in the Bermuda Militia Infantry. Brennan, Edward Joseph. A stepbrother in Bermuda's Vallis family, he died in June 1945 in action over Germany, having joined the RAF and later transferred to the American Army Air Force. He was awarded the USA's Air Medal, the Distinguished Flying Medal and posthumously, a Purple Heart. Brewer, John Edward Darrell Carlyle. Of 215 Squadron Royal Air Force, he was killed in action in May 1942 over Singapore, fighting the Japanese. Burgess, Howard Sinclair. Fireman and trimmer on the Henri Mory, sunk April 26, 1941. Torpedoed by U-110 in the North Atlantic. The U-110 had a very short career of only two sailings and was sunk a few weeks later. It remained afloat long enough for the British to board it and remove an Enigma code machine and many secret documents. Corbett, Frank Charles. He served with the Royal Navy/Fleet Air Arm on HMS Dipper, not a warship but at Henstridge Airfield, England, built during World War II as a training base for the Fleet Air Arm, who commissioned it as HMS Dipper. He survived the war but died at the age of 47 some months after the war ended, while still in the service. DeSilva, John. Bermuda Volunteer Rifle Corps, attached to the Lincolnshire Regiment. Killed at Overloon, Holland, October 14, 1944. Drew, Alfred David Drewsbury. Merchant Navy. On the Bermuda Roll of Honour but neither his date nor place of death are known. At the beginning of the Second World War in 1939, he was a young man of 20 years. He volunteered for convoy service to Britain and was lost when his ship was torpedoed or bombed at Milford Haven while at anchor. His date of death is not known and his name is not recorded on the lists of the Commonwealth War Graves Commission. John Headley Durham. Royal Navy. 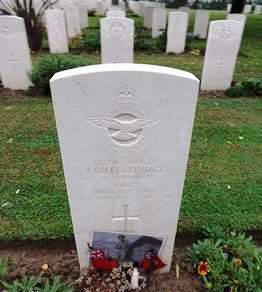 Ede, Herman Francis Grant, Flying Officer, Royal Air Force. 1940. June 8. Killed in action. Following the German invasion of Norway in April 1940, Ede was flying Gloster Gladiators with the RAF's 263 Squadron in Norway protecting the fleet anchorage at Skånland. On 2 June 1940, the squadron was ordered to prepare for evacuation. Along with the remaining members of his squadron and 10 aircraft, Ede embarked on HMS Glorious on 7 June. The next day, Glorious, along her escorts Ardent and Acasta, were sunk by the German battleships Scharnhorst and Gneisenau. Ede was just 23 years old, the son of Ernest Grant Ede and Winifred Louise Ede, of Pembroke, Bermuda. His name is inscribed on the 5th Panel at the Runnymede Memorial, Berkshire, England. Fowle, Alison William Bluck. Bermuda Volunteer Rifle Corps attached to the Lincolnshire Regiment. He died in late August 1944 at Calvados, France, as his unit was fighting to access Germany. Frost, Harry Reginald. Bermuda Volunteer Rifle Corps attached to the Lincolnshire Regiment, killed in late April 1945 in Germany. William Cardy Hollis Hallett, 21 years old, Pilot Officer, Royal Air Force, service number 66559, stationed in Malta where he flew Hurricanes, was killed in action, .He was the son of the Hon.Rupert Carlyle Hollis Hallett DCL.and Jessie Cameron Hollis Hallett, of Juniper Hill, Pembroke, Bermuda. Earlier, he had been Captain of Rossall School, England. 1939-40. Commonwealth War Dead Grave/Memorial Reference: Prot. Sec. (Officers'). Plot E. Coll. grave 19. Cemetery: MALTA (CAPUCCINI) NAVAL CEMETERY,MALTA. Harris, Elgar Frederick. A British Army parachutist, a Somerset man of the Perinchief family. He died in Tunisia in November 1942, along with all the members of his group who jumped with him from their plane. They were never seen again. Harris, Warren James. Bermuda Volunteer Rifle Corps attached to the Lincolnshire Regiment, killed in The Netherlands in early October, 1944. Hennessay, Edward Eugene. Bermuda Volunteer Rifle Corps attached to Lincolnshire regiment, killed March 1945 at Winnekendonk, Germany. Hughes, Frederick Gerald David. US Army Air Force. Died in an accident in May 1945. Hutchings, Douglas William Howard. Merchant Navy. Lost on January 16, 1941. An oiler, on one of the two British vessels sunk that day, the Zealandic and the Oropesa. Linton, James Hugh Arnold. Killed in action in April 1941 in Egypt. Meyer, Noel Lumley. Was returning to Bermuda via Canada after service with the Royal Air Force, from which he had been invalided out. He was travelling on the Lady Hawkins, one of the "Lady Boats" that had served Bermuda and the West Indies for several decades. The ship was torpedoed on January 19, 1942 south of Boston by U-66, with the loss of 255 souls. Meyer was last seen helping survivors into lifeboats, 71 persons later being rescued. Monkman, Francis Walter. Bermuda Volunteer Rifle Corps attached to Lincolnshire regiment, killed March 1945 at Winnekendonk, Germany. Outerbridge, James. Born 5 September 1922. Family lived in Flatts, Bermuda. Educated at Whitney Institute, Bermuda; Rossall School, England. Accepted for Rhodes Scholarship but was interrupted by war. Flying Officer, Royal Air Force. Assigned to 458 Squadron, Royal Australian Air Force (RAAF), then based at Luqa, Malta. He piloted a Vickers Wellington Mark 8 bomber HX 522. It took off from Luqa at about 2020 hours on March 24, 1943 but either had an engine failure or was struck by enemy fire. It ditched off the coast of Sicily. M.E.F. 1941-3. Killed, shot 1 May 1943 while attempting to escape from Allied P.O.W. 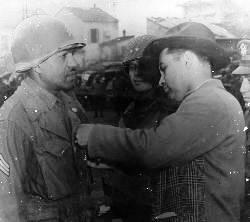 Camp 21 in Chieti, Italy, while being transported by train by the Germans and Italians to POW prisoner-of-war camp 39 in Palma, Italy, when the train stopped near Rimini. He may have been trying to get to San Marino, then a neutral state 20 kilometres away. During his attempt to escape he was seen and intercepted by a guard who shot and killed him. His body was later identified formally in the mortuary chamber of the Axis military hospital of Rimini. His name is engraved on a tombstone in the military cemetery of Ravenna, Italy, see photo below. Doris Paddock. Her exact role in the Second World War remains undisclosed. She achieved the rank of British Army captain at the age of 19, worked in a special unit that answered to wartime Prime Minister Sir Winston Churchill. She may have worked in espionage or served with Resistance forces in Occupied Europe. Patterson, Willard. Private, Bermuda Volunteer Rifle Corps, attached to the 2nd Battalion, Lincolnshire Regiment. Killed at Overloon, Holland, October 14, 1944. Service number 18005056. Buried at Overloon with his comrades. British Commonwealth War Dead, Grave Memorial Reference I B. 2, Overloon War Cemetery. Perenchief, Walter Hewson. Died in action in December 1941 at El Alamein, serving with the British Army. Scott, Frank. Flying Officer, J/43783, Royal Canadian Air Force. On 1st March 1945 the Wellington bomber in which he was serving crashed into the village of Norton, near Evesham, Worcestershire, England, shortly after taking off from nearby Honeybourne, bound for Germany. He was buried in Norton. He was the son of Arthur Havelock and Rena Scott, Tucker's Town. Shelton, Stanley Arthur. A member of the Bermuda Volunteer Rifle Corps, he'd been attached to the Lincolnshire Regiment. He died in action in February 1941. Smith, Major Anthony Frith (Toby). Bermuda Volunteer Rifle Corps, attached to the Lincolnshire Regiment. Killed at Overloon, Holland, October 14, 1944. Major Smith was one of 12 children, five of whom saw active military duties in two world wars. He and the entire first contingent of soldiers of the BVRC and Bermuda Militia Artillery (BMA), survived a U-boat attack in July 1940 and spent several years in the United Kingdom before finally seeing active combat. Meanwhile, his family struggled to make ends meet during the war from their home in the United States and then in Bermuda. Stephenson, Jay Circott. Bermuda Volunteer Rifle Corps, attached to the Lincolnshire Regiment. Died November 12, 1944 after being wounded by the enemy. He sought shelter in a barn in Holland, which the Germans set fire. His tags and a picture of his girlfriend identified him. He had a brother, Thomas Stephenson, also in the BVRC in Europe, who was not killed but very badly injured, shot twice, in an arm and face, spent years in hospitals in England and and Canada. He later returned to Bermuda, year not known. Thomas, Alfred John. Royal Air Force, killed in a bombing raid over Germany in July 1943. Vallis, Daisy Louise W. Died May 5, 1946. Only Bermudian woman killed as the result of WW2. She was killed on her way to be de-mobbed. She was a Leading Aircraftwoman of the Royal Canadian Air Force (Women's Division). Welch, Geoffrey A. Flying for the Royal Air Force, he was killed in action in early 1943 over Benghazi in Libya during the North African campaign. West, George Wendell. Died in 1942 at Timor from war wounds. White, Richard Martin. Bermuda Volunteer Rifle Corps, attached to the Lincolnshire Regiment. Killed at Overloon, Holland, October 14, 1944. Whitecross, James Standley. He had joined the RAF in November 1940. He was killed when flying over Germany in October 1943. Williams, Granville Barton. Unlike all other Bermudians, he served in the US Army. On May 2, 1945, he was killed in Europe. Earlier, he had received the Bronze Star, Silver Star and Purple Heart, for valor. Lieut. Cecil John Greenway Wright, RNVR. Died in action on November 24, 1941. He served in the Royal Navy Volunteer Reserve on HMS Dunedin when it was torpedoed on November 24, 1941, by U-124, halfway between Sierre Leone and Brazil. He was one of the 419 men lost, only 67 of the crew surviving. In 1940, Dunedin had been posted to the America and West Indies Station at Bermuda and thereafter was on the South Atlantic Station, pursuing enemy surface ships in those waters. Wright was a veteran of two World Wars, having served in the Great War in the Canadian Field Artillery and thus was one of the oldest men from Bermuda killed when fighting for the Allies. Members of Bermuda Militia Artillery (BMA) sent to Europe in World War 2. The author will welcome receiving their names, for inclusion here. Members of BMA celebrating after the war. They included Sinclair Furbert, with the BMA in Bermuda from 1943 to 1945. Members of Bermuda Volunteer Rifle Corps sent to Europe in World War 2. They included Herbert Tatem. Other Bermuda women served in England with the Auxiliary Territorial Service. Some indication of who they were will be welcomed so they can be mentioned here. Ernest Benevides (born 1922). Transferred from the Canadian Army to the RCAF. Brother of Lucy Benevides, mentioned below. A Bermudian of Portuguese descent. He attended Saltus Grammar School. He had left Bermuda to attend Queen's University in Kingston, Ontario, Canada at the age of 17, and enlisted in Toronto after receiving his first degree from that university (1943). After WW2 he attended Osgoode Hall Law School in Toronto and became a lawyer and a Queen's Council. He practiced law for decades in Toronto. He was the brother of Lucy Benevides, mentioned elsewhere. Timothy Joseph Card. Canadian Army. "He was among the very first to go off to Canada at the outbreak of the war. It is believed he went to Canada with a group some of whom ended up in the Canadian Air Force. He ended up in the Windsor Regiment (The Essex Scottish) as a Sergeant in the Intelligence Section. They trained near Barrie Ontario and were then stationed near Aldershot in England until they went ashore at Dieppe. He had an enduring friendship with an Officer named Worthington (don’t know the first name). He was wounded on the beach and captured and after convalescence in a POW hospital in France was interned at a Stallag near Dresden. At the end of the war, after several ‘escapes’, he ended up in the then Czechoslovakia (just across the border from Dresden) where he became part of a group running an ‘underground railroad’ assisting escaped and released Allied POW’s who were fleeing toward the west to escape the oncoming Russian forces. The Russians at that time were convinced that once the Nazis were defeated the Allies would turn on them. As a result they had a reputation for executing the internees of POW camps which they over ran - particularly Officers. Many German camp commanders therefore released their internees and told them to make their way to the west. The Czech group was supplying maps, directions, clothing and food to these freed allied troops. My mother, Vera Pokorna-Card, and her family were part of the group. Once the Russians took Czechoslovakia my father made his way to London and worked there to get a war-bride visa for my mother. He was demobilized in Halifax and came back to Bermuda. My mother joined him soon after and they were married at St. Theresa’s." Information kindly supplied by Jan Card, May 2015. Captain Fred Clipper (US Army). Joseph Levon. Served with the Bermuda Militia Artillery in WW1 at the Somme and other battles, and then served full-time in the Second World War at the barracks in St David’s. In those days the BMA would march to Warwick Camp with Levon leading the band as a drummer — often with his wife Lillian marching alongside from their home at Bailey’s Bay. Geoff Osborn RAF (awarded the George Medal, see Mid Ocean News story of January 22, 1972. He continued his career in aviation in ATC postwar in Dusseldorf, Germany; Lusaka, Northern Rhodesia (during the Comet runs to Capetown); then at Speke, Stanstead and Heathrow before returning to management in the Bermuda Airport. He retired to Poole, in southern England. His son Michael went into airport management in Bermuda. John H. (Jack) Osborn, RCAF (brother of Geoff Osborn who served in the RAF); served in Coastal Command of the RCAF in the North Atlantic and the North Pacific (after Japanese invasion of the Aleutians). He later lived in Lumberton, NJ, USA. He kindly supplied this author with some information on himself, his brother and Eldon Williams. Wing Commander E. M. "Mo" Ware RAF (after the war when he arrived, he remained in Bermuda and became a Bermudian). John Hartley Watlington RCAF. It took him more than a year to escape from France and return home, which he did on 10 July 1944. He authored an account of his adventures published in the Bermuda Historical Quarterly in 1949. Eldon Williams RCAF (older brother of Billy and Charley Williams), RCAF fighter pilot, shot down by friendly fire during D-Day operations. Jack Osborn saw him in hospital in New Westminster, British Columbia in 1945. Herbert (Chummy) Zuill RCAF, later a Bermuda Olympics sportsman and philanthropist. Also 0ther Bermudians, as graduates of the Bermuda Flying School. See Bermuda Aviation, under "1940." A number of black Bermudian airmen served with the Royal Air Force. They had previously joined the Bermuda Militia Artillery at the age of 17 or 18 or a little older in 1940. After three years of service on the Island, they were selected by the RAF sent to the UK and trained to become a member of a ground crew team. Cassie B. White. Her wartime actions were so remarkable they prompted General John J. Pershing, Commander-in-Chief of the United States Forces in France, to cite her in 1919 for conspicuous bravery and devotion to duty at great risk under fire. Lillian Bell, Lucy Benevides, Betty Mary Cousland Leighton, Daisy Vallis (killed in action), Royal Canadian Air Force (Women's Division) with Bermuda shoulder badge. Virginia Hooper. There were 17 other Bermudian women with the unit. Bermudian women in the Royal Canadian Air Force in World War 2. 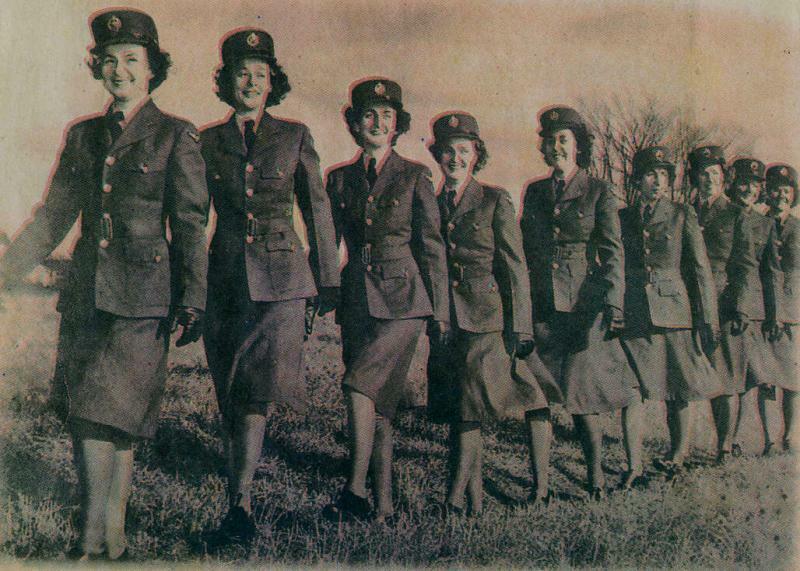 They included, from left, Lillian Bell, Daisy Vallis, Kathleen Bromby, Iris Jackson, Betty Cousland (later, Leighton), Lucy Benevides, Frida Rigby, Joan Lee and Mary Adams (not shown but present on right). Lucy Benevides stayed in the Royal Canadian Air Force until 1968, eventually as a Captain. Lobelia Curtis (later Bubenzer). 2017. October 3. 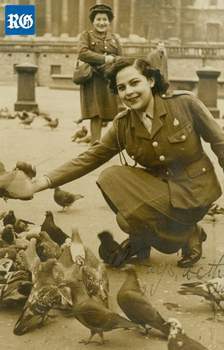 The only enlisted Bermudian woman to march in the Second World War victory parade in London has died aged 93. Margaret Ferrar and Eva Robinson, British Army Auxiliary Territorial Services. They endured convoys across the North Atlantic and bombings of cities and towns in England. In May 1945, when World War 2 in Europe ended, Miss Curtis was the only enlisted Bermudian woman to march in the June 1945 Victory Parade in London. Later, she married a German prisoner of war in England. Altogether there were 29 Bermudian women who served overseas in the Second World War. Many Bermudian women served in Bermuda during World War 2. Members of the Bermuda Militia Artillery included June Reid Smith and Betty Ingemann. Civilian women were also employed by local forces. They gave refugee and medical assistance, and supported or operated a host of wartime charity efforts including the Bermuda Women's Auxiliary Force, St. John's Ambulance Brigade, Bermuda Catering Corps and the Bermuda Services Overseas Association. 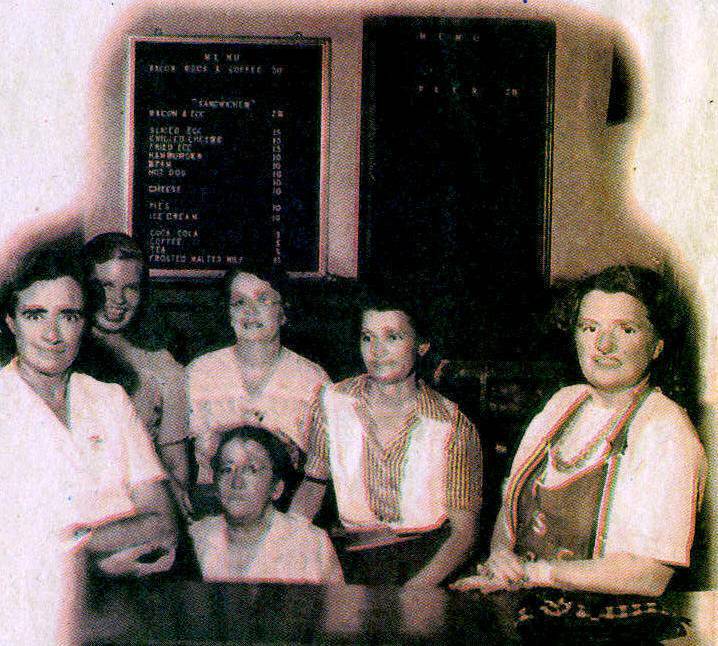 Bermuda Catering Corps war ladies who volunteered their services at the Hamilton Hotel canteen in World War 2. They included, from left to right, Charlotte Ellen Hobbs, Jocelyn Motyer, Mrs Norman Parker, Mrs. Nellie Creelman (seated), Jean Hill Qua and Mrs. William Frith. Bermudian Corporal Henry Eric Dowling, US Army. Killed in action in Korea on December 19, 1950. In US Army records he is listed wrongly as from the US Virgin Islands. Listed alphabetically. Limited to Bermudians, not those merely born in Bermuda but not Bermudian because they do not or did not have a Bermudian parent or parents. For clarification, see our Bermuda Citizenship. Elverton A. Mapp, US Army. Son of Mr and Mrs Elverton Mapp of Friswell's Hill. Mr Mapp Jr. lives in Huntsville, Alabama, served as a police officer for a state university. He left Bermuda in 1966 to attend college in Alabama and later enlisted in the US Army in 1971, retiring in 1994. His cousin Lawson Mapp was a Mayor of Hamilton. R. Luis Villafana. 1st Lt, US Army, Deep Sea Diving officer for 41st PC Company at Phu Cuong, Vietnam. Bermudian mother is related to Petty, Robinson, Gibbons, Chiappa, Card, Adcock, Wainwright, Newman, Watson, etc. Left Bermuda to attend college in USA. 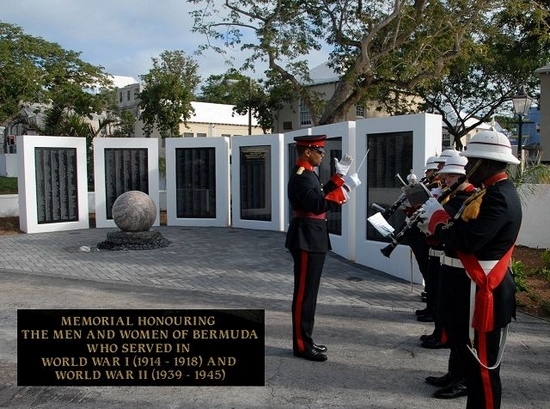 On May 9, 2013 a time capsule filled with soldiers’ memories was laid in place at Bermuda’s War Memorial. The burial of the safe containing books, documents and DVDs, marked the completion of the monument on the grounds of Cabinet. The Memorial commemorates Bermudians who served in the First and Second World Wars. The Bermuda Archives assisted in acquiring diaries from the First World War, details of campaigns that Bermudian solders were involved in, and service records. Veteran Herbert Tatem, who penned the war memoir ‘As You Were’, stood by as the hole was dug beside the stone slabs bearing the names of Bermudians who served. Other works included Jennifer Hind’s ‘Defence not Defiance’, a history of the BVRC, and the military documentaries of Lieutenant Colonel Brendan Hollis. The safe was buried beneath a concrete plinth and a granite inscription. It will be opened in November 2062 — 50 years after the Memorial’s dedication.